This name and logo were cut from .50 inch aluminum on our AXYZ CNC router. It was primed with Mathews etching primer and then painted with Mathews Satin paint. It was installed with studs threaded into the back. LED illuminated channel letters on a raceway. letters with 30 inch globe. 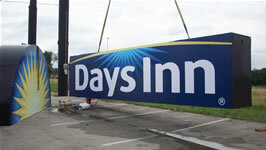 28 ft long Days Inn sign ready to install. Flex face with front and back printed graphics.Illuminated with metal halide lamps. 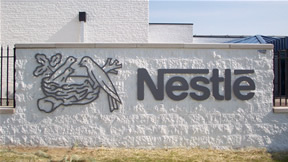 letters with 36 inch logo. and 10 inch smaller letters.